The inn, built in 1898 by E. Rose, articulates the Queen Ann style of architecture and is a significant Fayette landmark which is listed in the National Register of Historic Places. The inn's seven rooms are elegantly furnished with period antiques, each offering it's own charm to it's guests. The Rose House Inn is located at 325 2nd Ave. NW. For reservations call (205) 932-ROSE or 1-800-ROSE. Built in 1870 as the residence of Civil War veteran and Fayette Mayor John Buford Sanford, Columbus Street Inn is one of the oldest existing structures in Fayette. Though equipped with the latest in modern conveniences, it is furnished with authentic antiques and located in a quiet and prestigious neighborhood. Columbus Street Inn is located at 1043 Columbus Street W, just minutes away from the downtown district, area shopping centers, and local restaurants. Resident innkeepers Ben and Mary Hightower are “waiting to welcome you” for your stay in Fayette, complete with hot breakfast served each morning. All guest rooms are $60.00 + tax. For reservations, call (205) 932-4411 or toll-free 1-866-61C-SInn. You may visit the inn’s website, www.ColumbusStreetInn.com, for more information, photographs, and to make reservations online. You may reach us by email atcolumbusstreetinn@watvc.com. 1150 County Road 53 South, Fayette, Al. Owners: Frank and Charlotte Stewart - Phone 205-932-7200, 205-270-1065. Furnished Rental House. Country Home in Rural setting just 2 miles from center of Fayette. 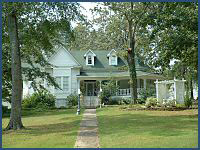 Two bedroom, (Double/Queen), one bath, living room, dining room, kitchen, sunroom, carport, large covered front porch. 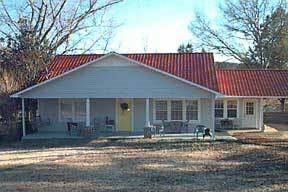 Central heat/air, washer/dryer, satellite TV, small appliances, local telephone. All utilities paid, maid service extra by arrangement, NO SMOKING, NO PETS. Directions: From Fayette, drive toward Berry on Hwy 18E/43S, pass Arvin, road narrows to 2 lanes, cross 4 bridges, continue straight at JCT Co. Rd 53, at mile marker 31 turn right, Bailey House is the first house on the left, it has a red tin roof.